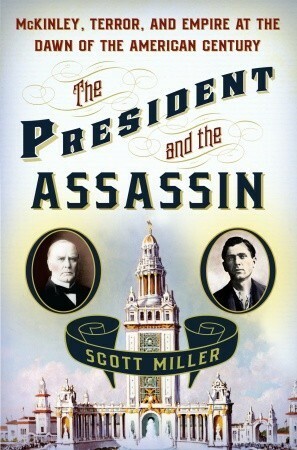 “The President and the Assassin: McKinley, Terror and Empire at the Dawn of the American Century” is Scott Miller’s 2011 tale of McKinley’s presidency – and of his assassination. Prior to writing this book Miller spent almost two decades as a correspondent for Reuters and the Wall Street Journal. Two things are immediately obvious to readers of this popular history. First, despite the fact it covers much of McKinley’s life in one form or another, this is not a traditional biography. Rather, it is two-books-in-one, alternating between story lines involving President McKinley and Leon Czolgosz (his assassin). Second, Miller is a natural storyteller and not a historian. He draws the reader into the narrative by vividly setting each scene; his style is perfectly calibrated to maintain interest. Rather than recounting tedious historical facts, Scott simplifies the landscape and engages the reader by dramatically describing the two Americas of McKinley’s day: one controlled by large corporations and another comprised of a working class struggling to survive on poverty-level wages. The book alternates between chapters focused on McKinley’s presidency and others focused on Czolgosz. Unfortunately, in order to fit McKinley into his narrative the author oversimplifies him as completely captive to big business and largely oblivious to the plight of the poor. Almost completely ignored are McKinley’s long-held views for strong tariff protection in sympathy with the working class. The thread involving Czolgosz is a fascinating (if depressing) description of the economic circumstances which led to increasingly frequent, and violent, labor unrest during this period. One can almost sense John Steinbeck’s approval of how Miller handles this aspect of the story. And although the reader never sympathizes with Czolgosz himself, it is impossible not to better appreciate the conditions that led to the era’s labor strife. The parallel construction Miller employs is interesting and potentially compelling, but imperfectly synchronized. The chapters involving McKinley are often several years ahead of adjacent chapters covering Czolgosz. As the narrative bounces between the two story lines, great care by the reader is often required to avoid confusion over the chronology. Only as the date of McKinley’s assassination approaches do the two timelines converge. To his credit, Miller does a far better job than most biographers in describing the American conflict with Spain over Cuba and the Philippines. His ability to boil complicated issues down to their most colorful and comprehensible essence is admirable. But in simplifying history, he often ignores or overlooks important (if tedious) nuances that are critical in really understanding a particular issue. But what is really missing from Miller’s book is a more complete portrayal of McKinley himself. His pre-presidency is only briefly addressed. His formative political years in Congress and as governor of Ohio, in particular, are given only cursory coverage. In addition, interesting (and revealing) moments are missed such as his cabinet-building process, his domestic policy efforts while in office, and his relationships with his ailing wife and most important political advisers. Despite these handicaps, however, Miller has authored a fast-paced and captivating book about the convergence of McKinley’s life with that of a disaffected anarchist who prematurely ended this president’s second term in office. Judged as a comprehensive and critical biography of McKinley and his evolution as a politician (a role it does not feign to assume) this book falls far short. But as a popular history focused on the events leading to McKinley’s assassination, Miller’s book is endlessly engaging and entertaining. I really enjoyed this one as well – though I’m certainly biased as I’m from Buffalo, and this book devoted itself largely to the unfortunate events that happened in my hometown.